Kelly’s Resort is a small family resort which has been in operation for over 60 years. In the spring of 1948, Bob and Dorothy Kelly and her parents, Chuck and Joy Garland, opened a small resort on twenty wooded acres on the South Shore of Lake Chelan. They opened it with the intention of providing a unique environment for guests to enjoy, and a beautiful retreat to the Northwest. Sixty years later, the Kelly family celebrates the continuation of that vision. Additions and modifications to the resort have been designed to enhance, rather that alter, the original intent. Hundreds of families have established their family summer traditions at Kelly’s as they have come to enjoy the forest and the lake, the solitude, and the mountain air. In our main building at water’s edge is a small convenience store, fireplace room, deck, and coffee bar. 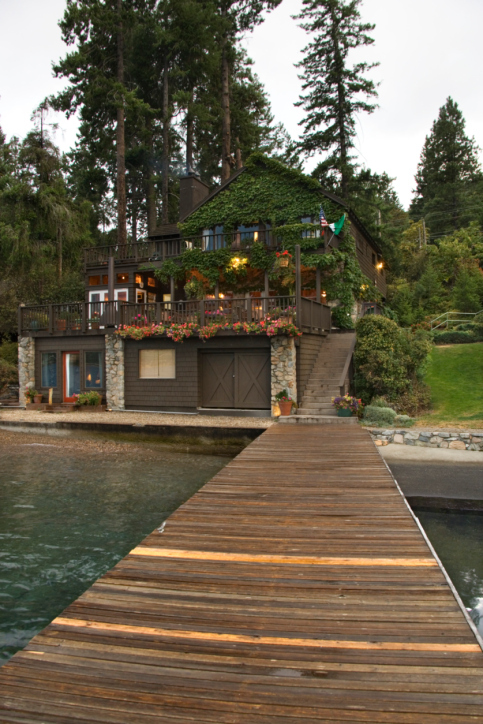 There is a sunbathing area, enclosed lake swimming, docks, diving board, and moorage. We have rowboats, canoes, and kayaks available for the use of our guests. In the upper cottage area we have woodland walking trails, a grassy play yard, a heated pool, and a laundry facility. A meeting/conference pavilion is available for meetings, family reunions, or guest get-togethers. It is our guests who have come to define our resort as much as the physical surroundings. We extend a profound thanks for over half a century of business and friendship and the hope that we can continue to welcome you in the future.